The Witmark Demos were recorded by Bob Dylan from 1962-1964 for the Leeds and Witmark publishing companies. These recordings were never intended for public consumption, but were produced to attract other artists to Dylan's original material. And it reaped major benefits. Dylan's early career got a major boost when his song "Blowin' in the Wind" became a smash hit for Peter, Paul, and Mary. While some of the performances are pedestrian at times, they're a crucial artifacts that dosument Dylan's development as a songwriter. Two versions of "Man on the Street" appear, an early Woody Guthrie pastiche inspired by New York street scenes. "Hard Times in New York Town" is a jaunty composition about life in New York sung in a 1930s cadence. "Poor Boy Blues" is about a young person struggling to survive in the city, the type character that would be on the receiving end of "Like A Rolling Stone." "Ballad for a Friend" laments the loss of someone close who bought it on a Utah highway. A tall tale song, "Rambling, Gambling Willie" is about a gambler who's exploits were known all over, he gave all his winnings to the sick and poor and meets a tragic end. "Talkin' Bear Mountain Picnic Massacre Blues" was based on an actual incident Dylan read about in The New York Herald-Tribune. A ship overloaded due to counterfeit tickets, Dylan spun the incident as a series of tragicomic imagery told from the point of view of a hapless survivor. The version here is improvised, cluing us into Dylan's early performing style, although "Bear Picnic" was left off his debut album with Columbia, Bob Dylan. According to Clinton Heylin, "Standing on the Highway" was a reworking of Robert Johnson's "Crossroads," an artist Columbia producer John Hammond brought to Dylan's attention. The early recording of "Blowin in the Wind" is the sound of history in the making, one he would perform over 1500 times live (and counting). "Long Ago, Far Away" has a drive to it, the lyrics are similar in theme to "Blowin' in the Wind," but sang with more anger and irony. Dylan's direct, almost child like vocal, gives it power. "A Hard Rain's A-Gonna-Fall" displays his ability to create memorable imagery. "Tomorrow is a Long Time" was an early love song. "The Death of Emmett Till" dealt with the brutal murder of a 17 year old African-American man from Chicago who was visiting relatives in the South. It was claimed Till whistled at a white woman, which was grounds for justifiable homicide in the Jim Crow South. Dylan's concern with social justice is at the forefront of his compositions from this era, an issue he would return to many times. The first four verses retell the awful crime and its aftermath, while the last two address the listener. "Let Me Die in My Footsteps," proselytizes existentialism towards the nuclear threat. "Hollis Brown" would appear on The Times They Are-a-Changin' LP, a tragic tale set in Dylan's Minnesota. "Quit Your Low Down Ways," "Baby, I'm in the Mood For You," "Bound to Lose, Bound to To Win," "All Over You", and "I'd Hate to be you on that dreadful day" are all nods to the blues. "Long Time Gone" has a Western flavor. "Talkin' John Birch Paranoid Blues" lampoons Cold War paranoia, a stand by of Dylan's early concert repertoire. "Masters of War" prophesied the coming of Vietnam. "Oxford Town" commented on Civil Rights, specifically the ordeal of James Meredith at the University of Mississippi. "Farewell," another folk standard, would be immortalized at the end of Inside Llewyn Davis. Disc Two begins with "Don't Think Twice, It's All Right," sounding very similar to the Freewheelin' version. "Walkin Down the Line," features a jaunty guitar and harmonica. "I Shall be Free" was always an early favorite of mine, a comical snapshot of the early 1960s. "Bob Dylan's Blues" and "Bob Dylan's Dream" both continue in the Guthrie condition. "Boots of Spanish Leather" was another stunning early composition written about Suze Rotolo, the version on this disc is especially striking. "Girl From the North Country" appears in a more subdued performance. More folk and spiritual ballads appear including: "Gypsy Lou," "Seven Curses," "Whatcha Gonna Do," and "Ain't Gonna Grieve." "Hero Blues" sounds like an early version of "Black Crow Blues" from Another Side of Bob Dylan. "John Brown" never appeared on an album, but Dylan resurrected it in the late 1980s, his striking performance for the 1994 MTV Unplugged special is a highlight. "Only A Hobo" is another 1930s tune Dylan sings with wistful defiance. A piano accompanied version "When the Ship Comes In" is another masterpiece Dylan wrote, one that will always be relevant. A priceless early version of "The Times They Are-A-Changin" also on piano follows. Although less quoted, "Paths of Victory," also invokes the Civil Rights Movement. "Guess I'm Doing Fine" sounds like a classic Hank Williams record. "Baby Let Me Follow You Down" appears minus the talking introduction. Disc Two ends with piano versions of "Mama, You've Been On My Mind," "Mr. Tambourine Man," and "I'll Keep It With Mine." 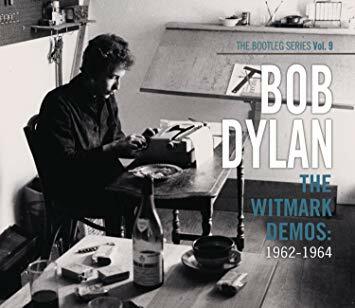 The Witmark Demos are essential listening for anyone interested in Dylan's development as a songwriter, as he moved away from the early influences and discovered his own voice. Heylin, Clinton. Revolution in the Air: The Songs of Bob Dylan, 1957-1973. Chicago: Chicago Review Press, 2012.